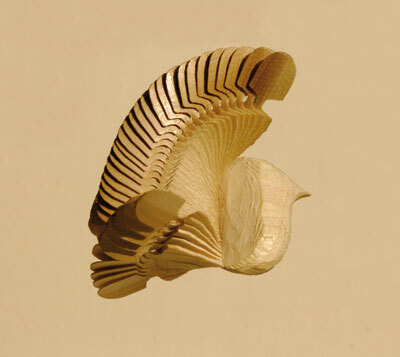 This bird is made from one piece of wood. Yes, that's right... one piece! 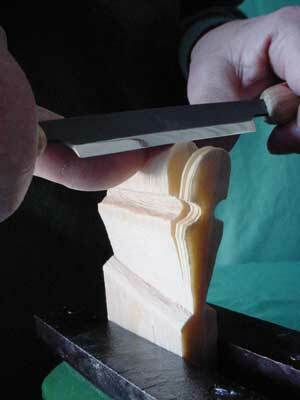 The technique is called fan-carving. 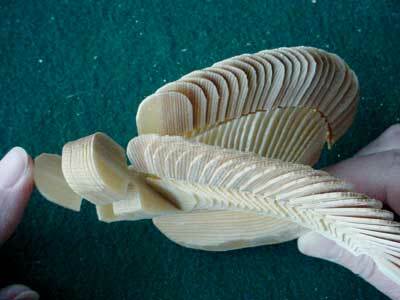 It is the process of riving (splitting) long-fibred wood into individual blades and then turning and interlocking those blades to create a three-dimensional design. 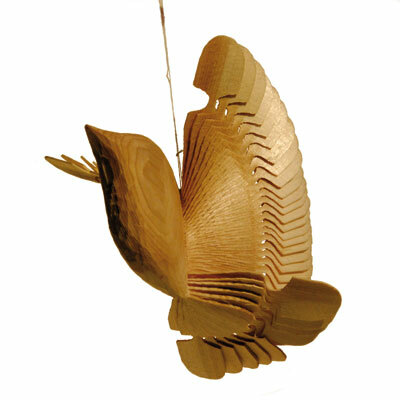 The fan bird represents the Holy Spirit, the dove-of-peace. In early times, it was customary for people to surround themselves with items that had meaningful symbolism. The fan bird is one of these (see picture 1). In the homes, the bird was hung by a string so that it moved freely with the air currents. It appeared to come alive and symbolised the Holy Spirit, protection, health and happiness for the family. 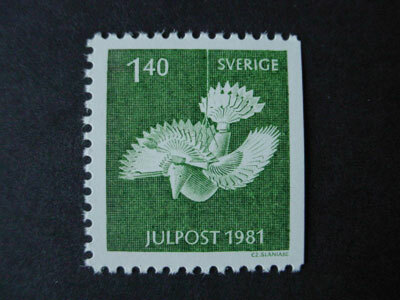 By the 1900s, the fan bird seemed to be everywhere throughout Scandinavia and Europe. In fact, two distinguished ethnographers proclaimed it a "cultural phenomenon". 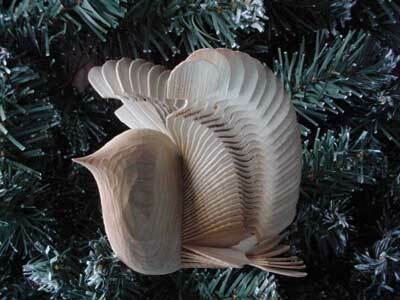 However, as time passed, fewer local artisans made fan birds. 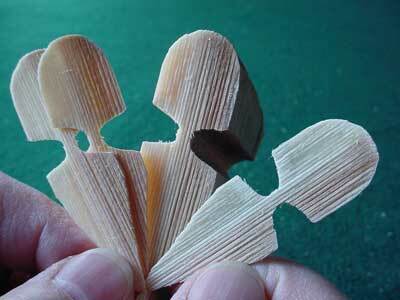 In time, the 'pulpit bird' was even replaced by a solid wooden dove. 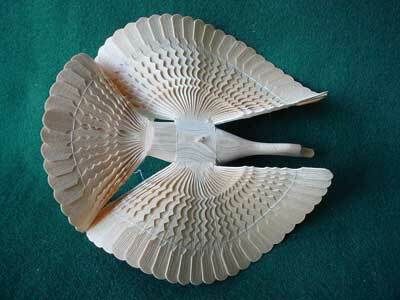 Sadly, few fan-birds are made today - in some countries they are only found in museums. 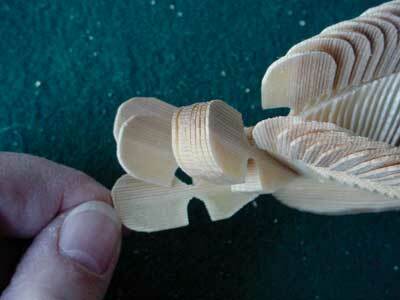 Fan-carving is almost a lost folk art. 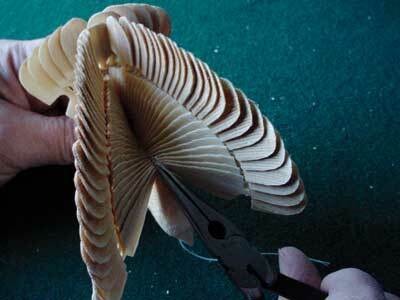 Regardless of style, all fan-carved items must have three basic cuts: the interlock, the hinge and rived wood. 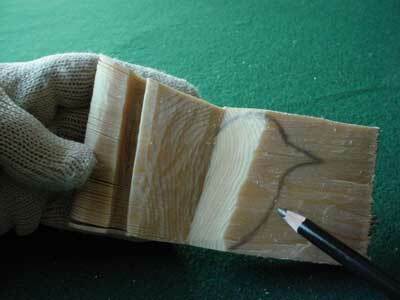 Score the width of the blank with a large knife/hatchet and mallet 25mm (1in) down. 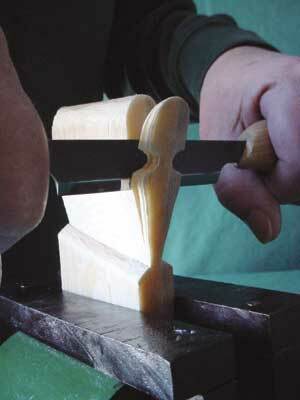 Place the hatchet blade parallel to the bark 19mm (3/4in) in from the outer edge of the round (thickness of blank + bark) and give it a solid whack with a mallet. 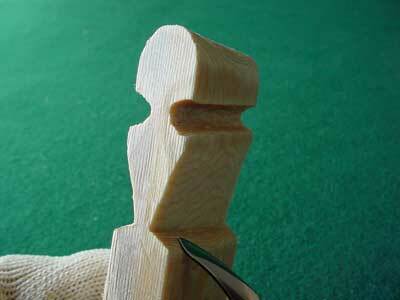 The force will cause the blank to 'pop out' as the fibres split along the score lines. 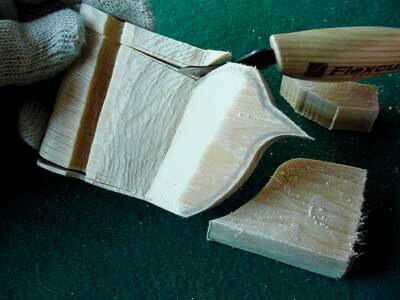 Use the hatchet to remove the bark, thus shaping the blank. 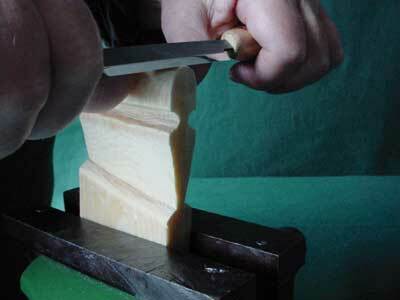 Repeat the process for more blanks. 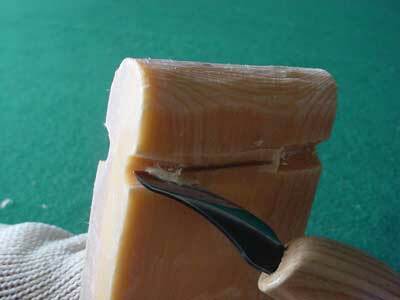 For adequate moisture content, place the blanks in water and simmer over heat for 90 minutes. 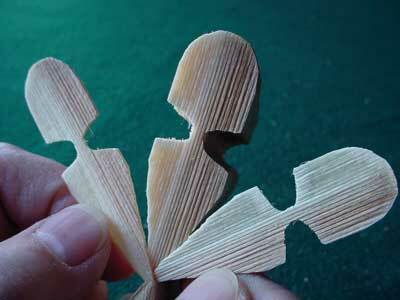 When cool, they are ready to carve. Store in plastic bags and refrigerate if used within two weeks. 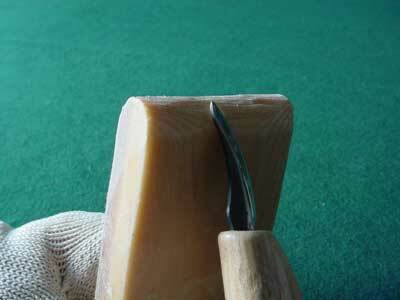 For longer periods, place blanks in the freezer but thaw before carving. 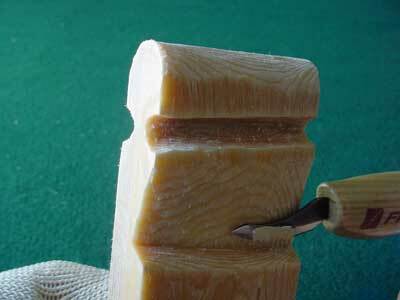 12 After the feathers are rived, use a knife or No.11 6mm gouge to trim the interlock and the hinge so they are narrower. 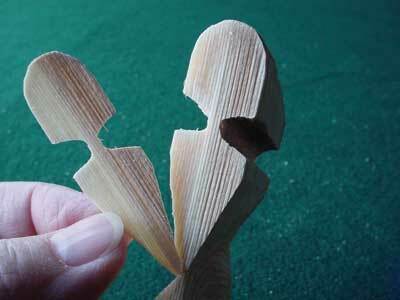 They were left wider during the riving process so the wood would not wobble. 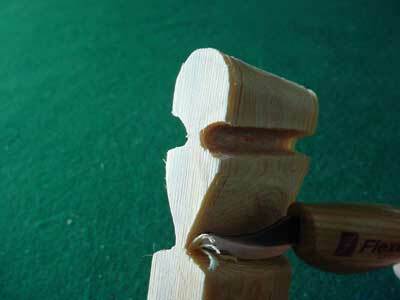 The interlock centre should now be about 3mm (1/8in), the hinge about 1.5mm (1/16in). 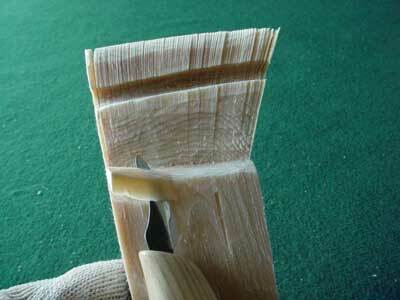 13 Next, trim the lower part of the short taper. This area needs to be airspace so the feathers can freely turn and interlock. Make a nice flat plane. 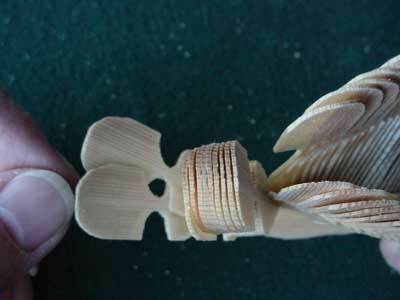 "The fan bird represents the Holy Spirit, the dove-of-peace"
Wood that is straight-grained and long-fibred is used for fan-carving. 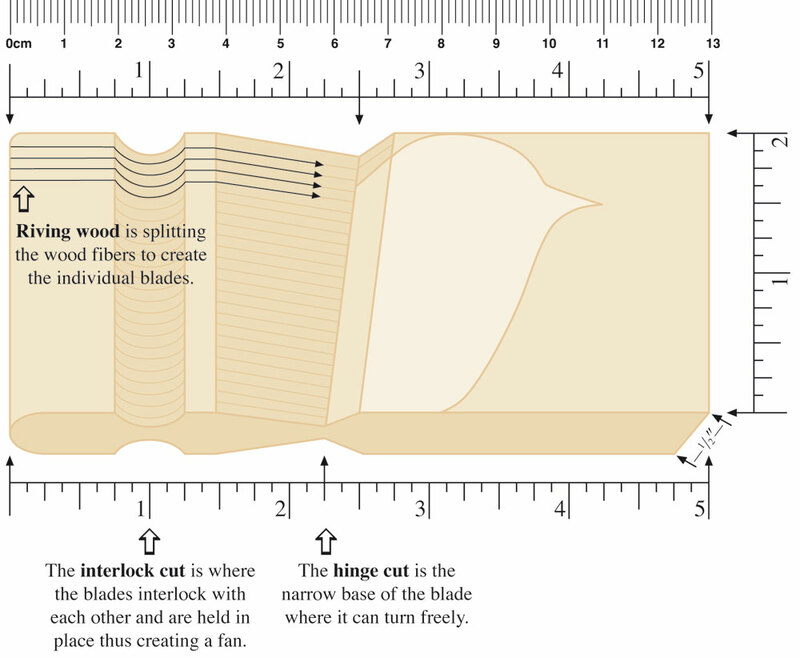 These characteristics are important because the strong fibre must hold on at the base of the blade when it is turned and interlocked with the next blade. 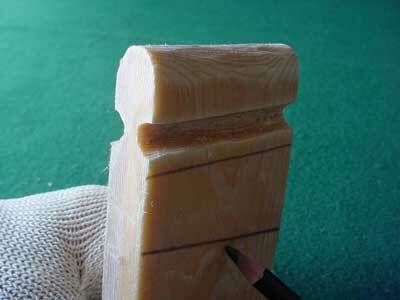 We use white cedar (Thuja occidentalis) in the USA. In Europe, fir (Pinus sylvestris), spruce (Picea abies) and willow (Salix spp) are preferred. Pine (Pinus spp) and aspen (Populus spp) are favoured in Scandinavia. 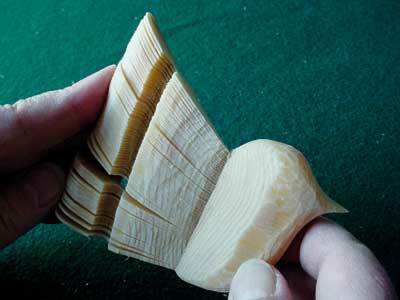 Try similar wood in your area or the kind used for making baskets. 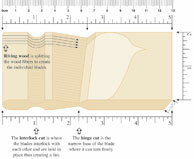 The blank dimensions used are 125 x 50 x 12mm (5 x 2 x 1/2in): 125mm dimension (length of blank) is vertical; 50mm dimension (width of blank) is along the circumference; 12mm dimension (thickness of blank) is the outer edge.